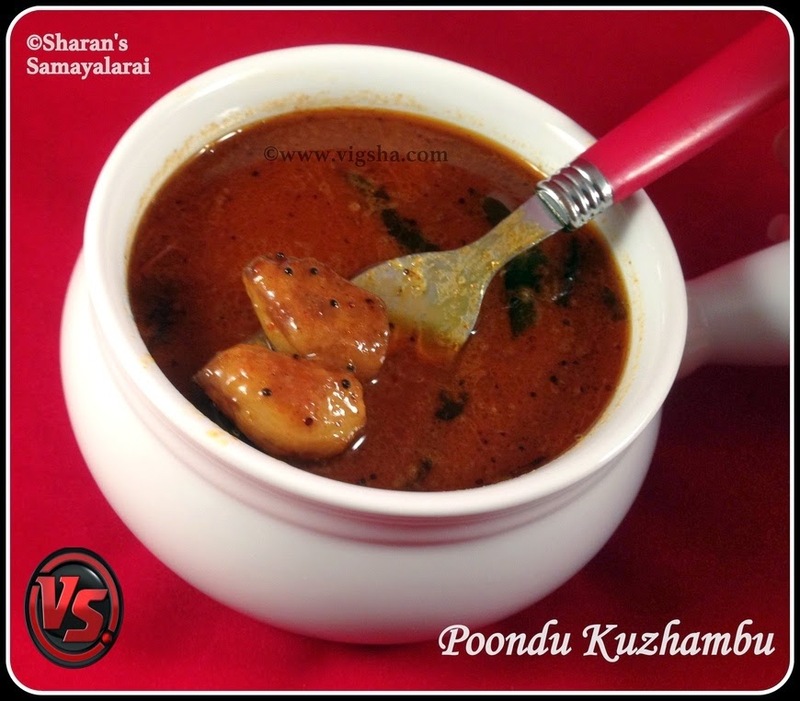 Poondu Kuzhambu is simple and an authentic gravy from South-Indian cuisine. This spicy lip-smacking gravy goes with steamed rice and appalam. 1). Soak tamarind in warm water and extract the juice, discarding the pulp. Keep it aside. 2). Heat Oil in a pan, add mustard seeds and let it splutter. Add fenugreek seeds, hing, curry leaves, onions, garlic, green chillies and saute till they turn golden brown. 3). Add the tamarind extract along with turmeric powder, sambar powder, salt and bring it to boil. Cook in medium flame, till it thickens and oil separates.Switch off the flame, transfer to a serving bowl. Serve with steamed rice and appalam or poriyal. # Chop the garlic, if it is big. Shallots suits best for this kuzhambu. # Sesame oil is must, it gives good flavor to the kuzhambu. So don't avoid. # The gravy thickens when it cools down and it can be store in refrigerator for 2-3 days. It tastes the best when served the next day.